Door latch inserts are designed for increased security and access. They are designed for a quick and easy conversion from the standard quarter turn latch, or mini quarter turn latch, with no added holes or cutouts necessary for installation. 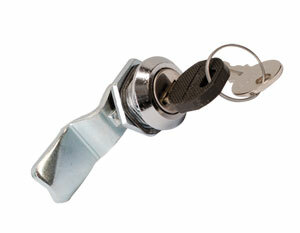 Choose from key locking or padlocking latches for added security or wing knob latches for easy access. The three-point latch kit is designed for use with all Enviroline Series enclosures 42" or higher. This latch kit will add a two or three point latching system to the enclosures with easy to cut and install rod guides and 5⁄16" round rods with rollers for a strong easy functioning latching system. No added holes or cutouts in enclosure are necessary for installation.